Sony is launching a head mounted display that provides a three dimensional theater of music videos, movies and games. 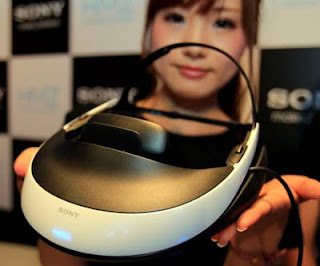 Sony Corp. showed the 60,000 yen ($800) "HMZ personal 3-D viewer" Wednesday. The machine is set to go on sale Nov. 11 in Japan, and is planned for the U.S. and Europe, perhaps in time for Christmas, although dates have not yet been set. Resembling a futuristic visor, HMZ, which stands for "head mounted display," is worn like chunky goggles-and-earphones in one. The footage before the viewer — a music video of a Japanese singer in the demonstration for reporters in Tokyo — is crystal-clear and feels like peering into a dolls house in which a real-life tiny singer is moving.